North Coast 500: More than 500 miles of the best the North Highlands has to offer. The route way runs to and from Inverness, venturing from the capital of the Highlands, up the West Coast and back via the rugged north coast. Wester Ross is part of the region of Ross-shire along with Easter Ross and is the first area you arrive in after taking off in Inverness. A truly stunning area of extravagant landscapes, lochs and roads, your NC500 journey will really begin to light your imagination as you drive. The Bealach Na Ba is only one of the first break-taking encounters in Wester Ross, followed by numerous lochs such as Loch Ewe, Loch Torridon and Loch Maree. Stop off at The Poolewe Hotel, situated on the shore of Loch Ewe, an ideal place to eat and/or stay. A warm welcome, good locally sourced food in the bar or restaurant, 13 comfortable en suite bedrooms, log fires in all public rooms, large car park, Wi-Fi, dog friendly. The main town of Wester Ross is Ullapool which is massively popular with travellers from all across the world due to its lively atmosphere and friendly locals. Ullapool is also the home of Loopallu, the north's fantastic musical festival. 'Loopallu' is held in September each year and holds the title for most rural festival in Scotland! Acts that have played here before include Paolo Nutini and this year you can listen to Mumford and Sons! Ideal for adrenaline junkies, Wester Ross also provides an abundance of activities to experience! Fancy gorge-scrambling or off-roading? 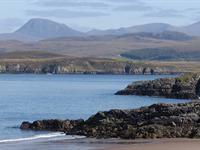 Where better to try it than Wester Ross?